Are you limited in your capacity to attend regular yoga class because getting on-and-off the floor is too challenging for you? Are you an injured athlete worrying about loss of strength and flexibility due to confinement? Whether confronted with injury or severe weight gain, the problem is the same: you don’t have the freedom to move as you wish, and this creates a lot of frustration. You have been deprived of your freedom to do simple things that make life enjoyable, such as hiking, dancing, or going to the gym. You are getting depressed, and rightfully so. I have been in the same place struggling with debilitating pain, unable to lie down, nor walk, not even drive. I hit the plateau where medication had no effect. Life wasn’t life anymore: it was agony. The doctor’s verdict was grim: must have surgery or face paralysis of the left arm. But I had different plans: I learned about the healing potential of yoga and decided to give it a try. Practicing through pain and with very limited ability to move made it harder then I thought. I quickly realized the difficulty of practicing without knowing how to modify poses and transitions for my specific problem. Finally, it downed on me to use a chair, and that was the turning point. I could approach more poses, besides the ones lying on my back or those done on hands and knees. I could even sit for pranayama. Soon the pain decrease substantially. 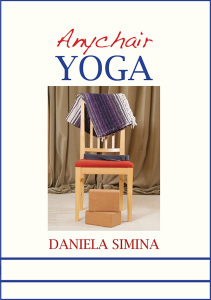 From the darkness of those moments of pain and fear Anychair Yoga emerged. This DVD is about using a chair in fun and engaging ways to create a practice that suits your needs, at home, in the office, or on the go. Yoga poses and transitions become available wherever you are, whether you seek a milder, restoring kind of practice or a powerful one. Enjoy a complete yoga practice with all major poses adapted so you don’t have to get on and off the floor. Practice at your desired level of intensity with the Rise and Shine and Power Up! modules. Develop awareness, the most important ingredient of all enterprises. Strengthen your core, and build strong abdominal muscles. Develop balance by practicing in fun and engaging ways. Release stress, relax, and renew. Leverage your breath to develop powerful health. The chair provides support, allowing to perfect form and alignment. Breathing techniques are weaved with physical postures in a cohesive routine. The Rise and Shine module teaches how to build intensity up to the desired level in a very gradual progression. The progression occurs in small increments, which is essential when recovering from injuries or overcoming plateaus. The second module, Power Up! is suited for those who have become comfortable with the first module, and for those fit individuals seeking new avenues to challenge their core strength. The Pranayama and Relaxation segments can be accessed and used independently. What makes this program unique is the fact that you get variations for each potentially problematic pose. These variations apply to common injuries of the back, neck, knees, hips, and shoulders. Core strengthening is a main component of both modules in Anychair Yoga, whether you need to start at a beginner level or you are an injured athlete who needs to stay in shape. Q: I have no flexibility. Is this yoga program suitable for me? If you are not flexible, then this program is particularly suitable for you. Practicing yoga on the chair provides the much-needed support for you to relax in the poses while maintaining proper alignment. As you release tension from the muscle through supported, gentle stretches in combination with proper breathing your muscles will gradually lengthen yielding in time for more flexibility. Q: I am severely overweight. Can this program help me lose weight? Yes, it does, both directly and indirectly. As you’ll relax with yoga posture and breathing, your body starts overriding effects of stress and cortisol levels get lower. Lowering cortisol reduces cravings and nervous eating. The awareness you’ll develop through this practice carries over into the daily living, and in time you’ll find yourself making wiser choices about food. Although done with a chair, this is not an easy practice. The second module brings in enough physical challenge to count as a “workout” boosting your metabolism to burn more calories. Just commit to regular practice and the results will speak for themselves. Q: I have never done any form of exercise. Would this program be too complicated for me to follow along? Not at all! This program gives an ideal start into exercise. The guidance is very detailed and precise, with options to follow in case you need modifications. The chair allows building up intensity in small increments to make your progress smooth and safe. After mastering the second module on this DVD you will most likely be able to practice on the floor. Q: I am in excellent physical shape, but a back injury prevents me from exercising at my habitual level of intensity. Is this program of any benefit for me? The benefit of this program is double fold. This kind of practice promotes deep relaxation that helps with pain management, as well as managing your own frustration related to this temporary limitation. As stress levels drop, inflammation in the body gets reduced, and healing rate speeds up. On top of this, practicing on the chair takes pressure of the injured part so you can still strengthen around the injury without creating any further aggravation. The chair provides support for your back and you can focus on strengthening legs, abdominals, improve balance and flexibility. Q: What should I do if I have any questions? We do welcome your questions. Just use the Contact form.